Happy Hour now is 4pm to 7pm on Fridays only. All other days, our doors open at 8:30 every night, unless otherwise noted. Please check our website calendar for specific times. Besides Fridays, now we are going to be open Wednesdays and Thursdays for Happy Hour. Happy Hour will be 4pm to 7pm Wednesdays, Thursdays and Fridays. All other days, our doors will open at 8:30 every night, unless otherwise noted. Three members of Portland, Oregon-based power punk band Exploding Hearts died early Sunday morning when their van flipped over on Interstate 5 near Eugene. Adam "Baby" Cox, 23, Matthew "Matt Lock" Fitzgerald, 20, and Jeremy "Kid Killer" Gage, 21, died after being ejected from the van as it rolled, authorities said. A fourth band member, guitarist Terry Six, 21, and the Exploding Hearts' manager, thirty-five-year-old Rachelle Ramos, suffered minor injuries, and were treated and released from the hospital. Ramos was the only one of the five wearing a seat belt. The band had played a Thursday night show at the San Francisco club Bottom of the Hill and was headed home when the accident happened. Authorities speculate that Fitzgerald, who owned the van and was driving, was overly tired and overcorrected after going off the road. The Exploding Hearts released their highly-rated Big Star-meets-Ramones debut, Guitar Romantic, in March. Cox sang and played guitar, Fitzgerald played bass and Gage, who earlier this month announced he planned to leave the band, played drums. Since the upstairs fire on April 28th. 2003, we do not have ticket printing capabilities. Therefore we no longer have advance tickets for sale at the club. On Monday, April 28th. 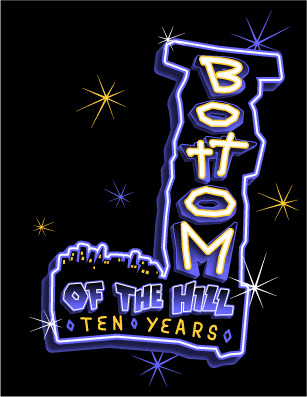 2003, our beloved Bottom Of The Hill was temporarily shut down due to a fire on the upper floor. Thanks to the help from our staff, from members of our community, and from our friends in the music industry, we are fortunate to say that we are back in business again. We are deeply touched by the overwhelming outpouring of support we have received from each and every one of you. We couldn't have done it without you. have been on September 11th.